Summary: The word “neoliberalism” is used widely but surprisingly few people really appreciate what it means. This brief summary outlines its importance. For most on the centre-left of the political spectrum it is the enemy and it is important each of us knows the enemy and recognises exactly what it is and what it has tried so successfully to achieve. Earlier in 2016 George Monbiot gave a talk in Cambridge to an audience of several hundred. Cambridge is notorious for being able to put up an audience of clever-clogs, but when asked how many knew what neoliberalism actually was, barely a handful claim to know. His excellent talk was written up in the Guardian on 15 April 2016 and can be seen in full HERE. This post is simply an outline of what neoliberalism is. George’s piece which is well worth reading in full. For serious addicts, there is a massive entry in Wikipedia which also shows that its manifestation in different parts of the world is somewhat different. However from the British perspective its importance and influence is very clear. It is in the UK that we might argue it has been applied in its harshest, most uncompromising way. The core idea underpinning neoliberalism is that each and every one of us is in competition with one another. As consumers we buy and sell goods and services and companies compete for our custom. Anything that interferes with that is anathema. Regulation should be eliminated and taxes minimised. Anything that assists the organisation of labour such as trade unions should be suppressed. Any activity of government should be privatised if at all possible. If you cannot afford a house or a good education or you do not have a job it is your fault and you only have yourself to blame. Certainly the state should do the minimum it can get away with to make your life any easier. Monbiot argues that one of the strengths of neoliberalism as a political philosophy was that nobody really knew what it was. Nobody could identify the radical changes in our society which were driven by neoliberalism. Naomi Klein showed how neoliberal is used a variety of crises to introduce yet more restrictions on the role of state and its capacity to support those at the bottom of the heap. 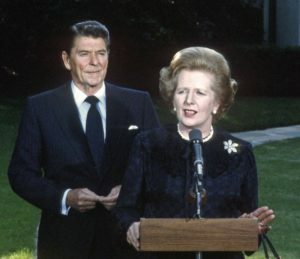 Right-wing governments such as those of Margaret Thatcher and Ronald Reagan followed neoliberal programs. Many right-wing think tanks from the Heritage Foundation to the Adam Smith Institute were financed heavily to propagate neoliberalism. Neoliberal attitudes became widely accepted by those who ran every part of our country, including the media, the justice system, the civil service and, in the UK, large swathes of the conservative party. The New Labour government of Tony Blair broadly accepted neoliberalism as the right approach to government even though the vast majority of those that voted for it were being progressively made poorer by that government. Austerity in recent years has been an almost perfect neoliberal manifestation. Above all neoliberalism is a policy almost perfectly designed to promote unfairness. It undoubtedly caused the crash of 2008 and the resurgence of the left-wing within the Labour Party. It has been key in attracting so many new members, and the recent revolution within the Labour Party must be seen substantially as an important move against neoliberalism. In the same way the dissatisfaction with government visible across all of Europe and indeed the United States may be attributed substantially to revolt against the neoliberal consensus.